Why do all deliciously crunchy and crave satisfying snacks have to be so far off from what you really want and need nutritionally? The usual snacky suspects like potato chips and other fried crunchy guys are heavy on the fat and carbs, but totally lacking protein. A balanced snack definitely needs a good dose of protein for muscle repair and building when meals are far spread apart. Plus, protein helps you feel full for longer, making it much easier to not get hangry before the next meal. Just a little bag of chips will probably have you feeling even more hungry like 20 minutes later, right? Roasted chickpeas are a very yummy answer to this snack puzzle. They have both carbs for energy and protein for muscles and fullness. Chickpeas are also a great source of fiber, which requires a long time for digestion like protein. Meaning even more satisfaction after eating. What I also love about these is because you cook so much of their water content out you don’t have to refrigerate them to store them. This makes for a great on the go option wherever you feel you may need a fueling snack to power you through and hold you over. 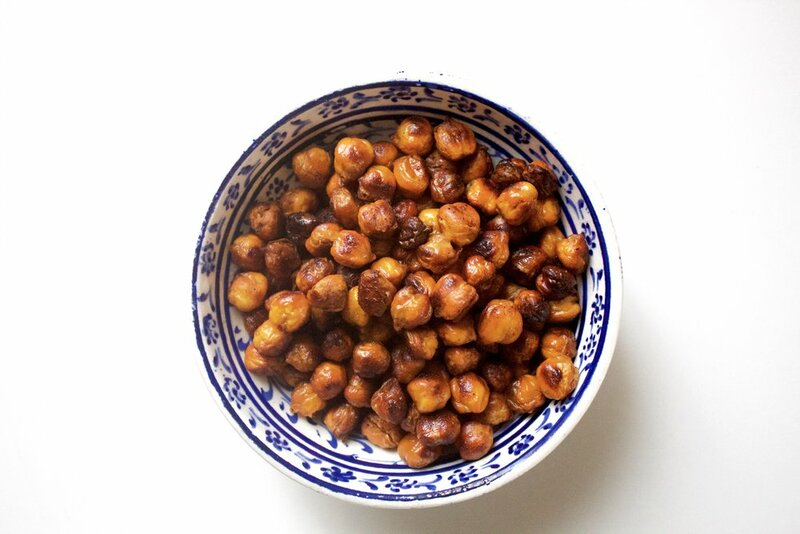 Roasting chickpeas completely changes their usual cooked, soft and dense texture to that which is amazingly crispy and crunchy. Coating them with lots of flavorful spices just takes it to a whole nother level. I chose a pretty addicting sweet and spicy flavor combo for these guys in the form of honey + chipotle. 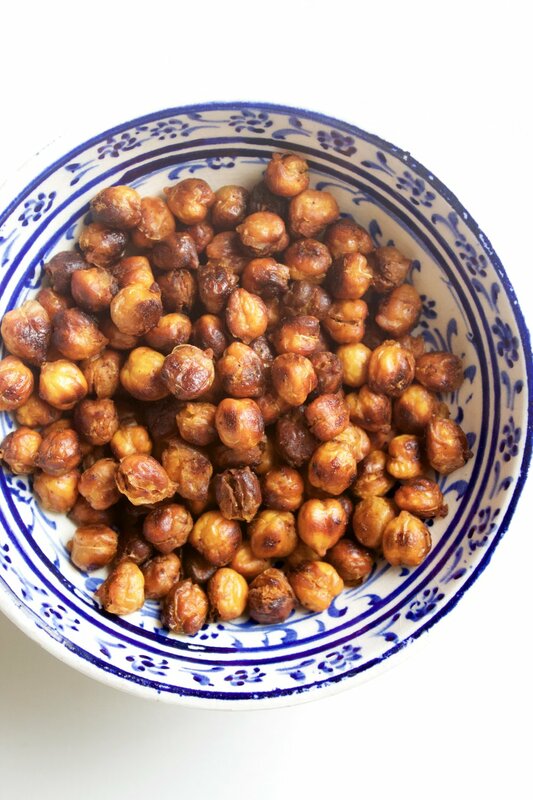 This crunchy/spicy/sweet/salty taste of these chickpeas is pretty powerful when it comes to squashing those less healthy snack cravings. 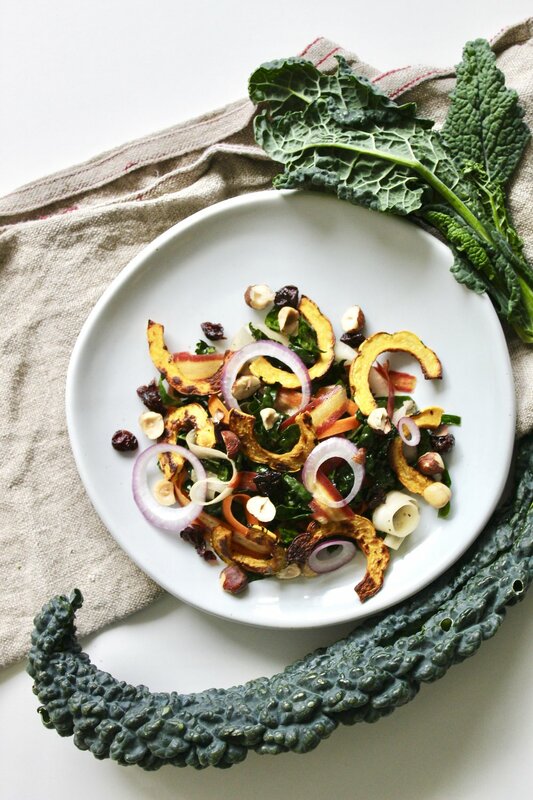 Try making this recipe for a small batch as written, or multiply to make a bigger batch that makes it super convenient to choose a snack that is equally fueling and delicious. Hope you enjoy! Lay out chickpeas on sheet tray that allows them to be in 1 layer with lots of room to spare and dry pretty well with paper towels above and below. Mix together the honey oil, salt, and spices. Pour over chickpeas and use hands to mix everything together to as evenly coat the chickpeas as possible. Roast in oven for ~50 minutes, shaking the pan around a couple times throughout cooking to help them cook evenly and not stick to the pan. 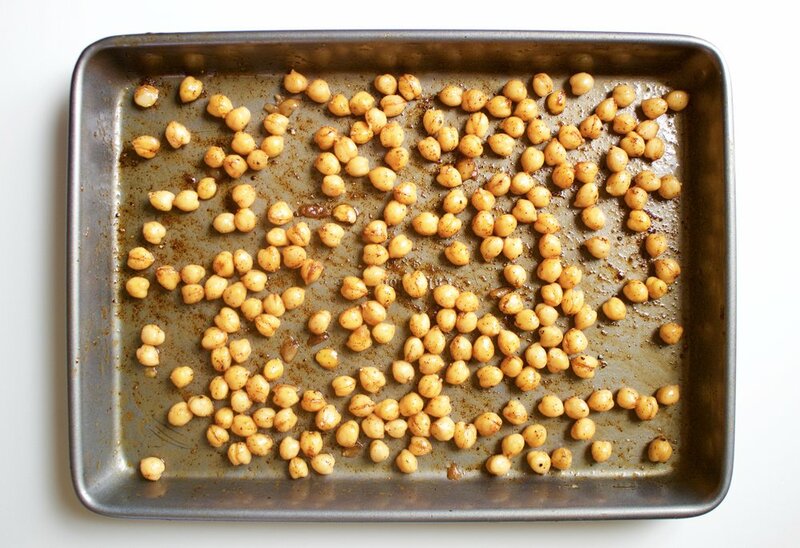 Chickpeas are done when they are deep golden brown and sound pretty crisp as you shake them around on the pan. Let cool to room temperature and enjoy! Notes: You can use reduced sodium chickpeas if you like. The chickpeas will get more crispy and flavorful as they cool down, so a tiny bit of chew in the middle is normal when you take them out of the oven. If you have a convection oven, definitely use the fan feature for even more crunch-just decrease the temperature to 350’F/175’C and cook for a few less minutes.